Jarome Iginla spent the better part of two decades as the heart and soul of the Calgary Flames. He has also played a major role on several occasions wearing the maple leaf for his home country of Canada in major international tournaments. As is the case with many of the respected hockey players of his generation, Jarome Iginla cards and memorabilia have a strong following in the hobby. However, he remains extremely affordable given his place in the game. A Stanley Cup victory will go a long way in establishing Jarome Iginla cards among the true elites among hockey collectors. Originally drafted by the Dallas Stars in 1995, he was traded to the Flames as a part of a deal that sent Joe Nieuwendyk the other way. After debuting during the 1996 playoffs, Iginla quickly became the face of the franchise, helping them rise back to prominence. This culminated in a run to the seventh game of the 2004 Stanley Cup Finals where the Flames ultimately lost to the Tampa Bay Lightning. Shop for Jarome Iginla cards on eBay. Iginla has led the NHL in goals twice and won the 2002 Art Ross Trophy for most points in a season. He is the all-time Flames leader in goals, points and games played. He's also second on the team in career assists. 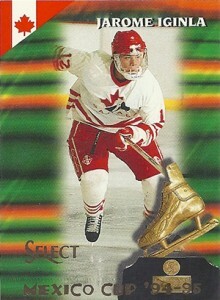 His international accolades include a pair of Olympic gold medals and gold at the World Junior Championships in 1996. Collectors have just three Jarome Iginla rookie cards to chase, all of which remain readily available and affordable. 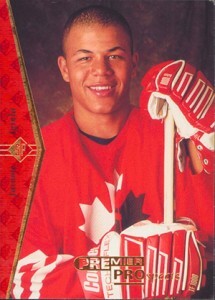 Over the years, Iginla has been a regular signer for hockey card sets. His autograph cards are a great option for those who want something more high-end than his rookie cards. Even then, there are lots of autographs that are still very reasonably priced. Released during the lockout, 1994-95 Parkhurst SE was supposed to be released to the international market. But that didn't stop a lot of the product from reaching North America. It's more like a 1994-95 Parkhurst Series 2. 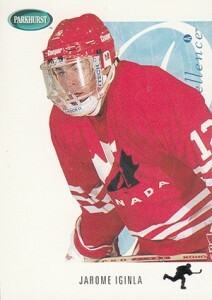 The Jarome Iginla rookie card comes with a clean design, highlighting his participation on Team Canada. A Gold parallel carries a very small premium, if any. Visually, the 1994-95 Select Jarome Iginla isn't going to have a lot of fans. A small photo, clashing colors and wild gold foil fonts make for an interesting design (and not in the positive sense). But as one of just three Jarome Iginla rookie cards, it has some importance. Not surprisingly, it's the cheapest of the three cards. The 1994-95 SP Jarome Iginla is his only rookie not to picture him wearing a helmet. The portrait has a classy feel that's further enhanced by the red foil name plate on the side of the card. 1994-95 SP Hockey remains extremely affordable given the brand's popularity as a premium product. Given Iginla's stature, this should be the go-to rookie for most collectors. The set also has a die-cut parallel that costs about the same amount. Below you will find an example of what Jarome Iginla's authentic signature looks like. This can be used as a first point of reference for determining the legitimacy of autograph memorabilia, but is not a substitute for having your items authenticated by a well-respected professional autograph authentication company. Some of the trusted sources within the sports memorabilia market include the following companies: PSA, JSA, Steiner and Mounted Memories. 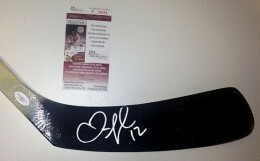 The signature is written on an even horizontal plane with a slight lean to the right. Many of the letters are implied. The letter "J" is larger than the rest and is awkward in appearance, resembling something closer to a flattened out heart shape. The remaining letters of the first name are implied by a small sideways shepherd's crook character. The pen lifts to start the letter "I" which more closely resembles an over-sized lower case cursive "l."
A small loop below the plane comes back up off the "l" and into the remaining letters, the next one resembling a slightly curved "<" but stood on end, point up. A true letter "l" with a bulbous loop finishes the signature. 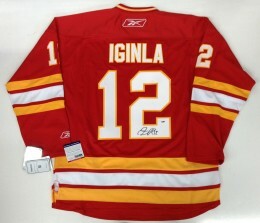 The signature is often inscribed with "#12" or "12", which is Iginla's jersey number. 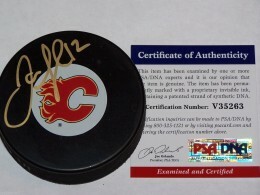 Jarome Iginla Autographed Signed Calgary Flames Helmet JSA COA NICE Autograph! I have a signed still reprint copy of a Jarome Iginla(photo by Gerry Thomas) 2010-2011 6×9 glossy with stats on the back from 91-92 to 2010…I cannot find this anywhere on the net!! Just wanna know a bit ore about it. Can you help me? ?